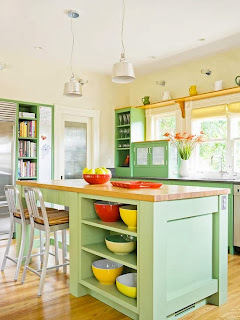 Afraid of going too far with colorful cabinetry? Then concentrate it where it will count. In this kitchen, the hutch-inspired unit along one wall was painted an eye-catching red color. 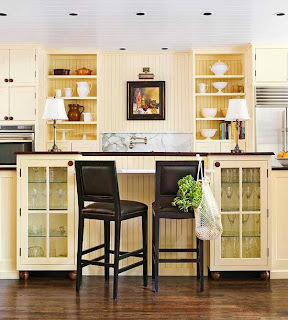 The rest of the cabinets were painted white or stained with a dark, rich color. 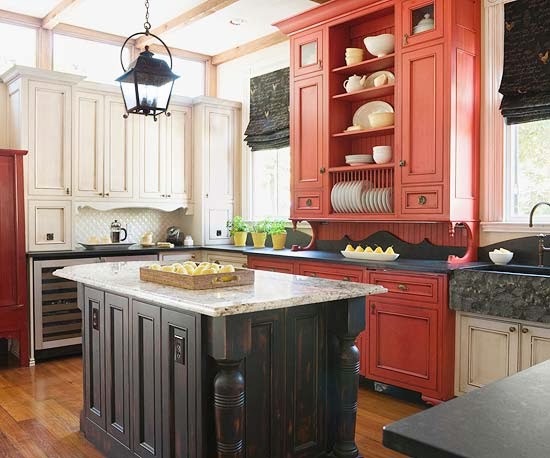 Although the splash of red is anything but subtle, it doesn't overwhelm the kitchen with color. 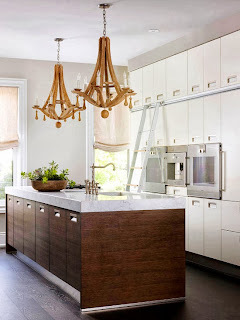 White is a color, too, and going with more vibrant cabinetry in your kitchen doesn't mean you have to exclude white. 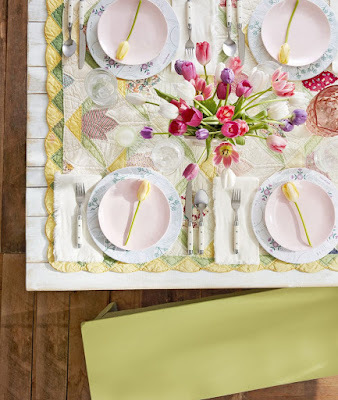 Mixing colors lets you enjoy the best of both worlds -- and ensures a visually interesting result. 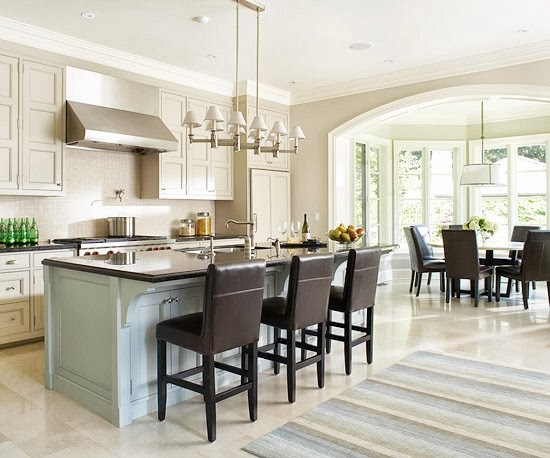 In this kitchen, teal cabinetry along one wall is lightened by a white tiled backsplash and center island. Not sure you want your cabinets to scream color? Aim for more of a whisper. This pale blue island reflects a pastel approach, which is the result of layering a creamy-white glaze over a bright blue one. 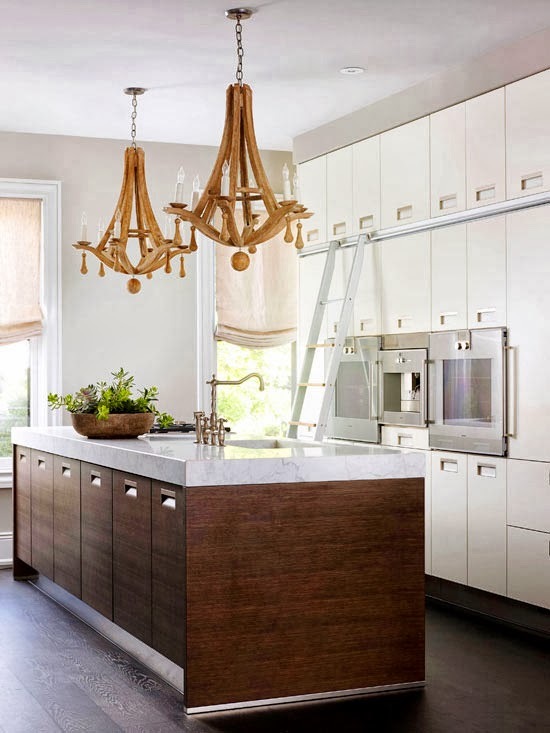 The off-white cabinetry throughout the rest of the kitchen exudes a soft and welcoming energy. Worried that natural wood-tone cabinetry would be too dark for their kitchen -- especially during the minimal daylight of Midwestern winters -- these homeowners chose cherrywood cabinets with a golden-yellow painted and glazed finish. Now, no matter what the time of day or year, stepping into this kitchen is like walking on sunshine. 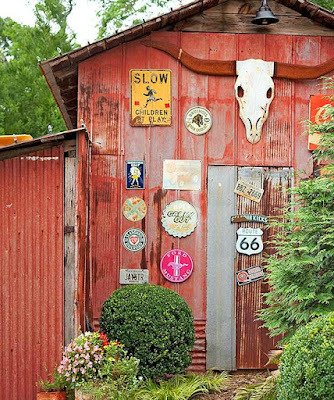 It's no secret that using your home's location is an easy way to cultivate a color palette. These robin's-egg blue cabinets give a nod to the stunning views of the land and sky just beyond the kitchen windows. The cabinets were also treated with a glaze, which gives the cabinets an aged look and the kitchen a casual, lived-in vibe. 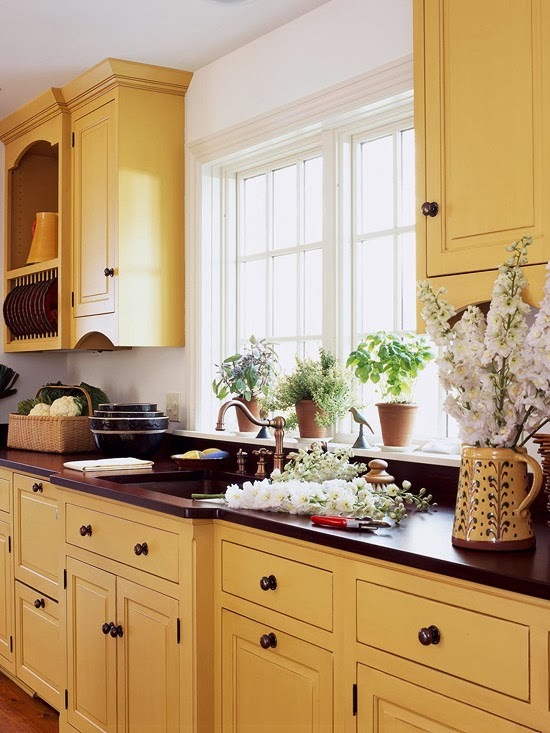 Yellow cabinetry gives even the darkest kitchen a sunnier disposition. 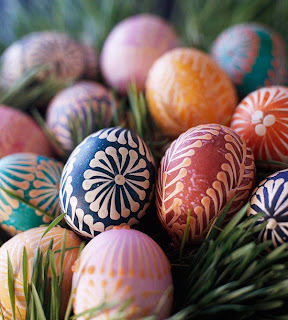 But yellow comes in a surprising variety of shades, from pale buttermilk and zesty lemon to subdued gold. This kitchen's cabinetry is a buttery yellow, warming the cottage-style space without overwhelming it. The white ceiling and the hardwood floor tone down the brightness. 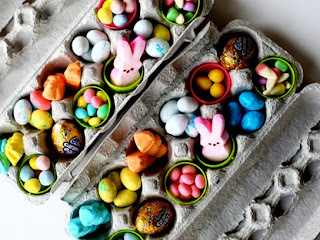 Looking for a quick and easy way to enliven an all-white kitchen? 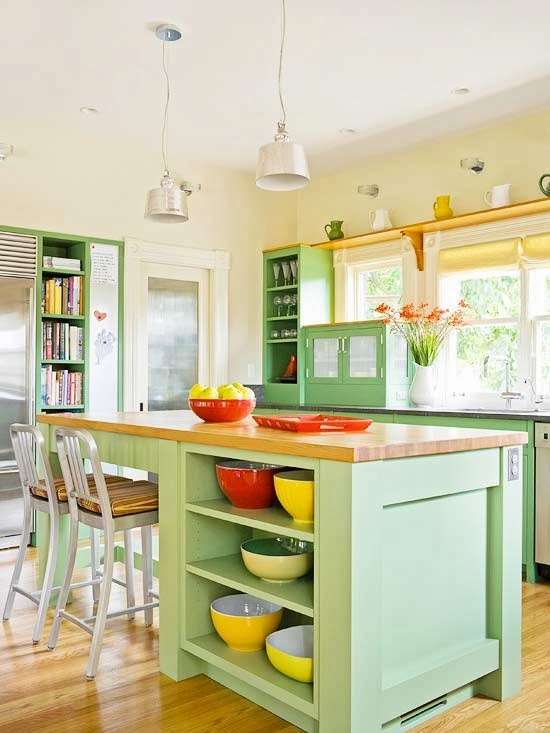 Take a cue from this one and paint the cabinets with an eye-catching hue. 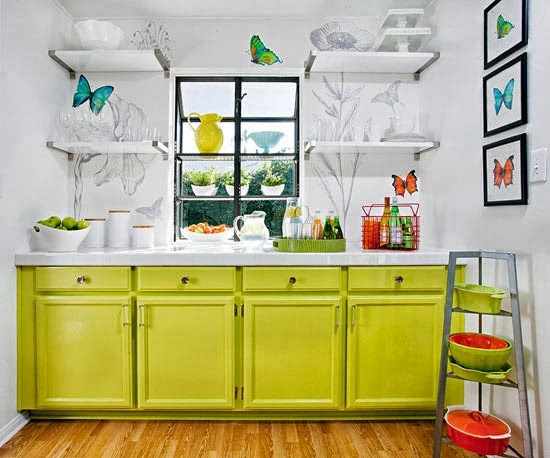 The bold chartreuse color of these cabinets personalizes the standard builder-style cabinetry and complements the whimsical butterfly prints and wall decals sprinkled throughout the kitchen. 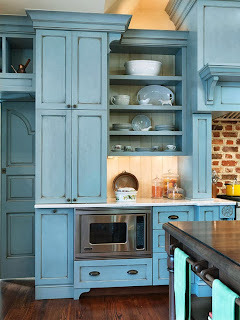 It's not just the brighter hues that make cabinetry colorful. The subtle sheen of stainless steel inspired this kitchen's calming palette of gray cabinets and blue backsplash tiles. 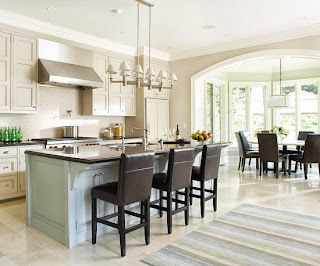 The soft gray hue of the cabinetry modernizes the kitchen but doesn't overwhelm the somewhat small space. 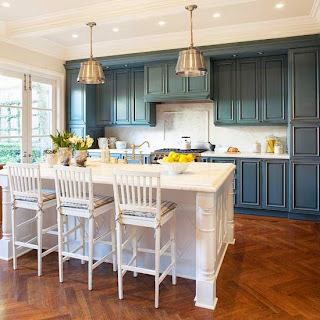 Using painted cabinetry doesn't mean forsaking natural wood finishes elsewhere in your kitchen. 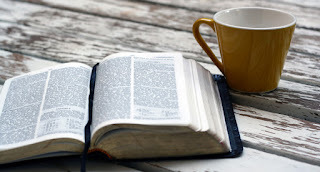 In fact, some colors and woods work especially well together, with one surface reinforcing the other. For example, the rich hue of this island adds dramatic contrast to white-painted cabinetry and a thick marble countertop. The dark finish of the island blends in with the flooring, which helps anchor the piece in the center of the kitchen. Colorful collectibles and traditional styling give this kitchen a welcoming, vintage look. 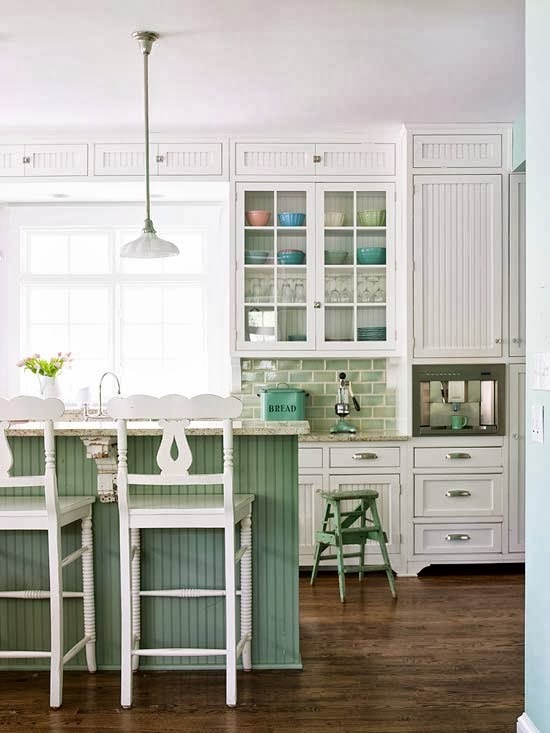 Drawing inspiration from a collection of antique dishware, the milky green color of the island is a fresh accent for the white cabinets. The beaded-board paneling used on the island base adds subtle texture. 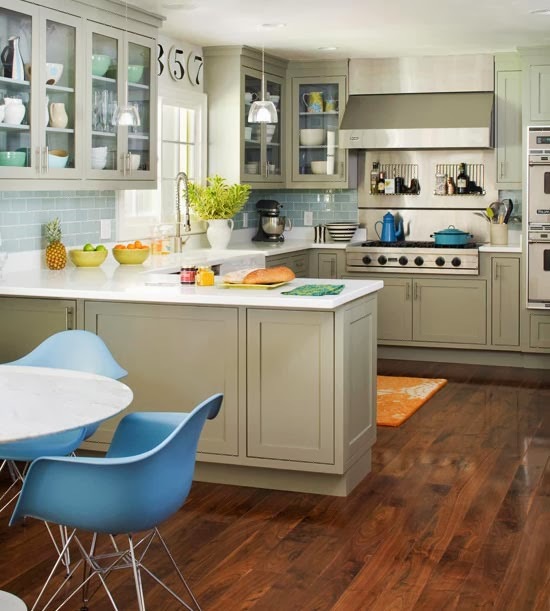 Bright colors, featured on cabinetry, mixing bowls, and more, give this kitchen an energetic vibe. 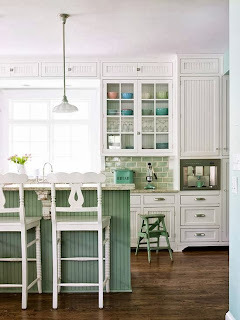 The cheerful mint color of the island and the surrounding cabinets looks right on trend and ensures the hardworking space is welcoming for the whole family.